The price of LED bulbs have dropped significantly. I show you how to find LED replacements for your 4 foot fluorescent tubes. I go over where to find them, costs, how to use them and the ratings that make effective grow lights. I also show you two inexpensive out of the box LED lights you can use immediately. Amazon price will vary as I quoted Walmart in store price. The out of the box set-ups only require you to hang them in the location that will host your seed starts. Just hang and turn them on. LED lights are inexpensive to run and you'll find starting your own vegetable starts will save you a lot of money. The video will cover they systems and key elements to help you make an informed decision. This is probably the most complete guide on YT for starting tomatoes and peppers indoors, through harvesting them and all the steps in between. Every step can be found in the digital table of contents. Just click the section you want. I cover all aspects of seed starting, all aspects of taking care of transplants, all aspects of planting and tending, how to mange pests & diseases, how to save seeds and I show you an entire year's growth of these plants. This was a 9 part series from 2106. 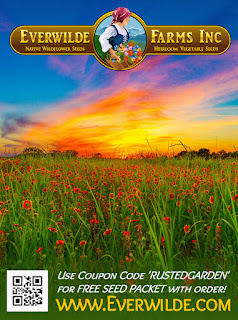 Best viewed on my YT channel The Rusted Garden to get the working digital links. Enjoy. 4:15 Mold, Fungus and Fungus Gnats - Seed Starting Mix Fix! 14:00 I Don't Use Organic Fertilizer at Initial Planting - Why? If you don't use a lot of seed starting mix and you only pot up a few plants to grow as your vegetable transplants, you are better off buying prepackaged mixes. However, you need to sterilize it to decrease your chances of hatching fungus gnat eggs. If you use a lot of starting mix and use potting mix to grow your seeds starts to a larger size, making it yourself will save you a lot of money. It is very simple and you can adapt the mixes to your personal needs. A 2.2 cubic foot compressed bag of peat moss will cost you between $10 and $15. A 2 cubic foot bag of fine vermiculite will cost between $20 and $30. These are the two key ingredients for making starting mix. You will be able to make 60 - 90 quarts of mixes. I recommend not using perlite in the starting mix as it just isn't needed for your germinating seedlings. You can add perlite to make more of a potting mix when your plants are ready to be moved into larger containers. This video explains the ratios and it will show you how to make the different mixes and what they look like. A key to having successful seed starts is sterilizing your seed starting and potting mixes. Always buy dry ingredients as the first rule. Never bring in soil, dirt or other amendments from your garden as the second rule. You will bring in dormant fungus, diseases and insect eggs. Once they are given the warmth of your home and the grow lights... they will mature along with your seedlings and cause great problems. Problems you can prevent by using heat. Peat moss comes dry but fungus gnat eggs will sit and wait for moisture. Rule three, is to use boiling water to pre-moisten your starting mix before you start your seeds. You can also use the microwave to heat pre-moistened starting mix but should do this at your own risk. Boiling water is safer. The video discuss these principles for sterilizing your soil and ridden them of fungus, diseases and insect eggs. 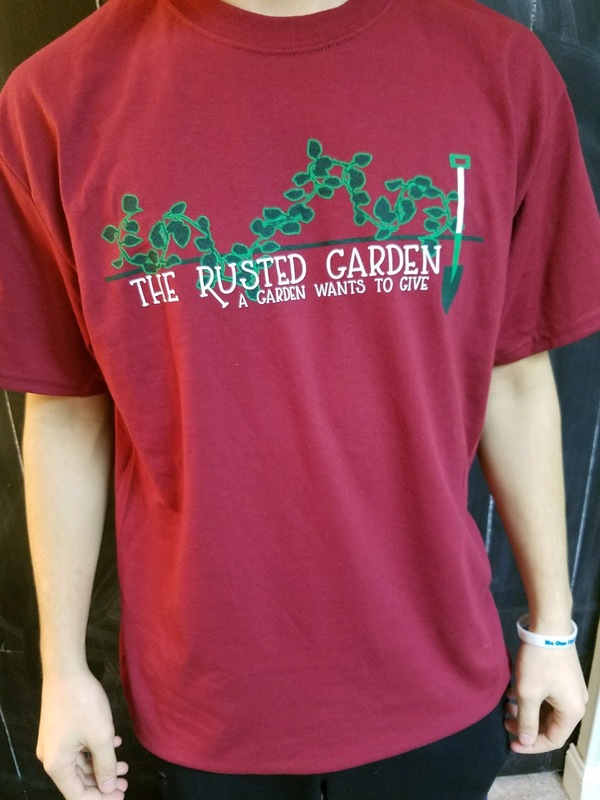 My Seed and Garden Shop: My First Shirt - A Garden Wants to Give! Some much can be found in the vegetable garden. I have written a blog post before about memories of my grandfather and how he taught me to grow a garden. I'll be doing a long format video series this year called Mental Health, Wellness and The Vegetable Garden which is really about how gardening can help you have a better quality of life. These are some ways a garden gives back to us. Last year I launched my Seed and Garden Shop. It is packed with all the things I use in my videos. This year I just added my first shirt with the phrase 'A Garden Wants to Give'. I chose the word Give over Grow for several reasons. Vegetables want to grow but a garden wants to give. It gives back in so many ways. It gave me a chance to connect with people (fellow gardeners) from all over the world. It gives me peace of mind. It adds to the quality of my life. And I truly believe that a garden truly wants to give. It just needs a little help and guidance from each of us. And when we need a little help, it is there to give back. That, thought inspired this shirt. If you are interested in purchasing one, I wanted to explain the history of the shirt and what it means to me. 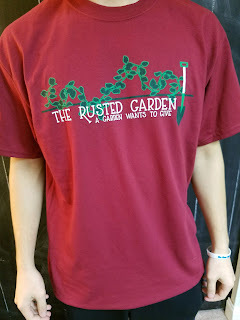 You can find my shop here: The Rusted Garden Seed and Garden Shop. 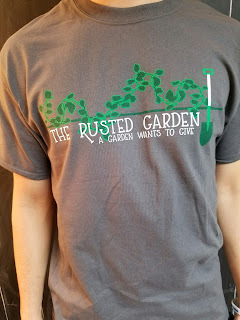 In addition to my short focused videos all about vegetable gardening, I will be doing an ongoing long format video series called The Rusted Garden Show. It will be packed full of information and the topics will be relevant in real time to what is going on with gardening in Maryland Zone 7. It is also available for free as a podcast, just search The Rusted Garden on ITunes or at Podomatic.com. The Rusted Garden Show EP 2 teaches you how to build simple and inexpensive grow light stations. I show you several designs and explain how to use the lights to grow strong transplants. I also show you how to seed start herbs and onions using my over seeding method. Please use the table of contents to move through the EP 2 as it will show up below on the video description. You can jump to the parts that interest you.